If you are experiencing one or more of the following symptoms of stroke, you should call 911 immediately, even if the symptoms cease on their own. All of these symptoms could be related to other conditions, so it is important that you receive proper diagnosis and treatment. If it is a stroke, the best chance for recovery is to receive treatment within the first three hours after onset of symptoms. At Lovelace Medical Center, we are proud to offer a 12-bed dedicated stroke unit with neurosurgery services and 24/7 neurology coverage. What's done in the first minutes or hours after a stroke may determine the level of recovery the person will achieve. Lovelace Medical Center treats every incoming stroke patient as an emergency. Patients arriving in the emergency department experiencing stroke symptoms are evaluated for possible treatment with t-PA (Tissue Plasminogen Activator). Lovelace Medical Center's emergency medicine physicians have been trained in the assessment of acute stroke and work in collaboration with our highly trained neurologists to ensure a quick diagnosis. Lovelace Medical Center's highly-trained stroke team is prepared with the skills and equipment necessary to quickly assess stroke symptoms and determine the proper immediate treatment. Our expert stroke team consists of neurologists specially-trained in stroke diagnosis and treatment, emergency department physicians, registered nurses, respiratory therapists and emergency department staff who provide immediate response which dramatically impacts a patient's successful recovery. This team can be accessed 24/7 in response to the emergency department, as well as other hospital departments, for urgent patient assessment. Other members of the Lovelace Medical Center team include physical, speech and occupational therapists, dietitians, case managers and social workers. The team also relies on the excellent services of Lovelace Medical Center's lab, pharmacy and radiology departments. Being honored for excellent patient care is the best recognition a hospital can receive. These certifications recognize Lovelace Medical Center's ongoing dedication to excellent stroke care, but our greatest reward is serving our patients. That's why we're committed to turning treatment guidelines into lifelines. 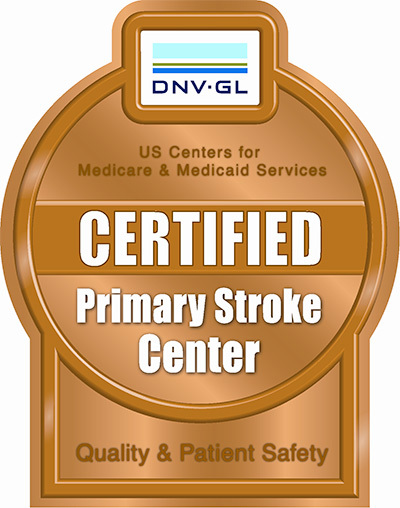 DNV-GL’s Primary Stroke Center Certification is based on elements from their NIAHO® hospital accreditation standards, as well as requirements from the Guidelines of the Brain Attack Coalition and recommendations of the American Stroke Association. A list of programs certified by DNV-GL is available at www.dnvglhealthcare.com. 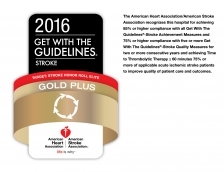 This award recognizes Lovelace Medical Center’s commitment to improving stroke care.